Dr. Chen graduated the medical school from Rutgers New Jersey. He is specialized in Oncology. 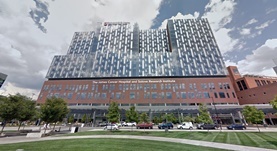 Dr. Chen has been in practice for more than 11 years and is affiliated with The Ohio State University Wexner Medical Center and with James Cancer Hospital and Solove Research Institute, as well. During his career, he has also contributed to various publications of medical interest. Dr. James Chen has contributed to 3 publications. Exosome-derived miR-25-3p and miR-92a-3p stimulate liposarcoma progression. Croce, C. M.,Casadei, L.,Calore, F.,Creighton, C. J.,Guescini, M.,Batte, K.,Iwenofu, O. H.,Zewdu, A.,Braggio, D.,Bill, K. L.,Fadda, P.,Lovat, F.,Lopez, G.,Gasparini, P...; Cancer Res.. 2017 Jun 08. Next-generation sequencing survey of biliary tract cancer reveals the association between tumor somatic variants and chemotherapy resistance. Ahn, D. H.,Javle, M.,Ahn, C. W.,Jain, A.,Mikhail, S.,Noonan, A. M.,Wu, C.,Shroff, R. T.,Chen, J. L.,Bekaii-Saab, T.; Cancer. 2016 Aug 09.